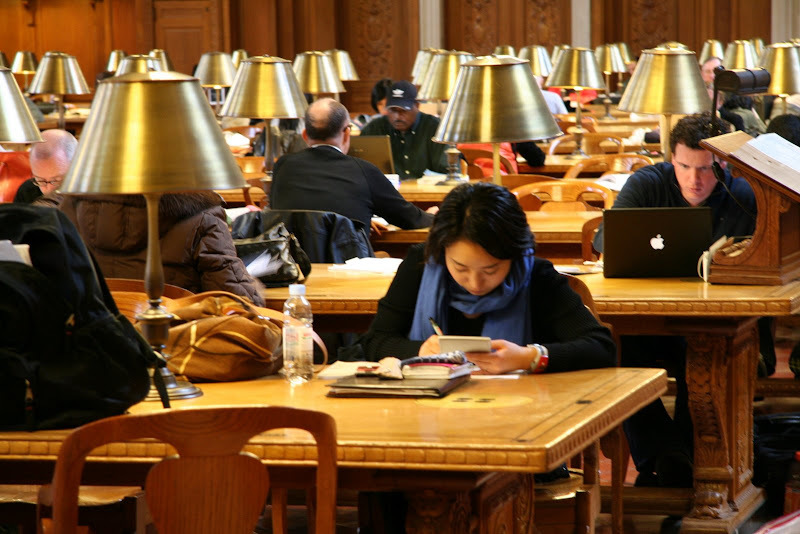 It's interesting that a least two people in the photo are using the libraries wi-fi to read online. I used to work in a library in high school, but my noisy friends always got me in trouble! Do you travel for work? You seem to be everywhere!! ok, so where was the cookie on Brilliant's website? My Yahoo news link now features a Beta version of the Santa Barbara media and when I click the internal links on it, I see last address as the one Brilliant's website. Hm...? this is a seriously nice picture. i saw my local library in a movie on cable recently. it is a happy place. merle - I have another pic from a different angle and it looks like everyone is using a laptop! I liked this one as one can still see some paper. I admit I'm still quite fond of paper and books. rlb - oh my still blogger probs for you! it's not your internet connection is it? anyone else having blogger probs? saretta - I have a special fondness for libraries. in h.s. I did an internship during my senior year at the library of congress and then one (and the last and longest)of my work study jobs in the college was at the university's library. I've often joked that I probably should have gone to library science school! but perhaps I was a librarian in a previous life? tee hee. rlb - I don't grok. pardon. eddy -what's the movie? I want to check it out!!! lettuce - I (heart) libraries!! I love the 'liberry' (as my nephew calls it). Funny how little kids always seem to say it that way! One of my projects for this weekend is to locate the closest library to my new apt. After registering to vote, getting a library card is usually the next thing I do when I move. I love the library. I used to work in one. Lots of undercurrents in libraries, lots of assignations, even. Plus my librarian was a bit of a Luddite, so we resisted the computer (the trustees made him have one, but he kept it down cellar in its box) in favor of the card catalog. We even had a rotary phone. Why did I leave? !